" /> 2018 Jeep Wrangler Highland MI | Szott M-59 Chrysler Jeep " "
The newest and most exciting addition to the Jeep lineup is the 2018 version of the Wrangler. This new version of the classic off-roader you want to experience on the trails is waiting for you at our dealership of Szott M59 Chrysler Jeep. Imagine the fun you can have in this SUV that you’ll take home to Highland, MI today after you see our expert team. The Jeep Wrangler has been one of the most iconic SUVs on the market and you’ll be lured to the area of our lot where these vehicles reside. Take a walk around and look at the proportions which are only slightly larger than in the past while you also admire the classic look and feel of an SUV you’ve become familiar with in the past. This is a vehicle that will make you daydream about heading out on the trails to have the fun you want in the wilderness, and our team can help make that happen for you when you make the drive from Highland to White Lake, MI to see what our team has to offer today. 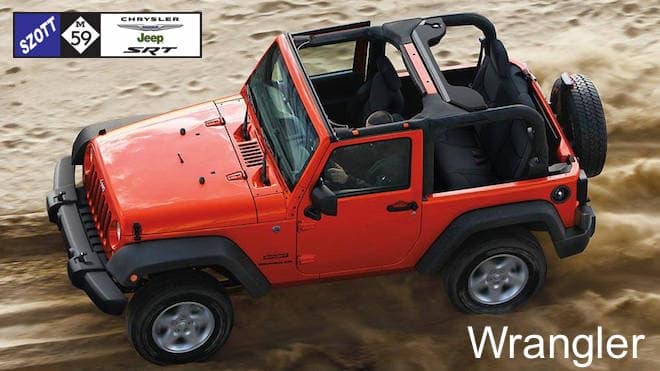 What makes the Jeep Wrangler one of the most admired and desired vehicles on the market? This SUV is one that matches up to more upgrades on the market than any other. There are so many custom items you can add that you’ll be amazed by what you can do with the Wrangler. Before you take yours to a custom shop, ask our team what can be added by our dealership. This allows you to have dealer included items that will also be covered by the warranty you enjoy for this vehicle to give you the peace of mind you’ll enjoy. Jeep offers the newest version of the Wrangler for you to drive. The size difference you notice when you see it on our lot is in a vehicle that’s longer, wider, and improved from last year. There are new engines you can choose and an interior that’s more comfortable than in the past. If you like to fold down the windshield, this is much easier than in the past and the doors are lighter and easier to remove as well. Le our team show you everything you want to know about the Wrangler today. One of the only drawbacks of the Jeep Wrangler of the past was the on-road driving experience. That’s not the case any longer. With a suspension that’s tuned right, the Wrangler you choose at our location will be easier for you to experience on the road. Imagine driving around Highland, MI showing offer the new 2018 Jeep Wrangler you chose from our dealership of Szott M59 Chrysler Jeep. Come in and let our team help you have the right version of this SUV for you to have the fun you want on and off the trails today.